Social media marketing is one of the cost-effective social media strategies. It can improve the visibility and build awareness of a brand among people. To improve the efficiency of social media marketing, you have to choose the right tools which will help you to develop your social media campaigns. By using social media tools you can find a lot of content to share, schedule your posts efficiently, measure and analyze all the information regarding social media. 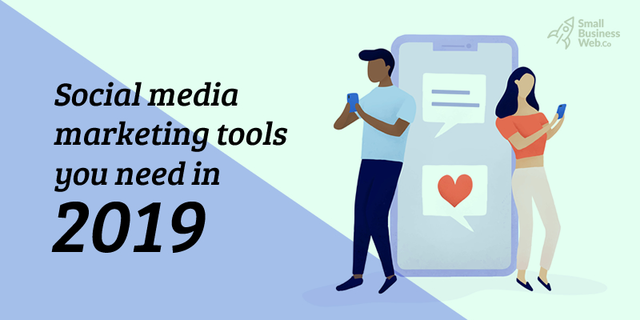 In this blog, we have analyzed some popular social media tools that will help with your business social media activities. Buffer is a well-known social media tool that can schedule all types of posts and design all patterns of the post. Using buffer you can evaluate the most effective posts and the reason for their effectiveness which will help you create the next content in a better way. Sprout Social is an optimization platform for brands and agencies. It has features like multi-level access, directional control, better team coordination, and delegate tasks. It has post scheduling capabilities, a detailed analytics platform, and even a social listening platform. MeetEdgar is a scheduling tool which is used to recycle the old posts. If you organize and schedule the content by category it will automatically post your content. Once this is done MeetEdgar will revise the scheduled posts and it will start recycling the older updates. Hootsuite is social media tool meant for intermediate marketers. There is a free version through which you can schedule posts on social platforms and provide analytics to measure the performance of the content. IFTTT (If This Than That) is a free tool through which you can gather and combine different tools to create a set of instructions as per your requirement. For example, if you post on Instagram then a tweet will be sent automatically using this tool. SocialOomph’s functionality makes it stand apart from other apps because you can add various updates like listing a number of blogs which can be published in certain time intervals on different platforms all at once. It also provides access to follower analysis features to improve audience engagement. BuzzSumo is a tool which is used to discover new, fresh, and popular content on the web. It helps you to find out why blog posts fail in a particular category. You can also get a list of influencers sharing the content. Feedly is a well-known content discovery tool. By using Feedly, you can collect content from various areas to combine it into a compact material that you can make use later. It provides information that is efficient so that you will never miss any. Oktopost is a tool which is designed for B2B companies. It helps to schedule content, measure effectiveness, curate to share, manage social media teams, and listen to social conversations. Tagboard is a social listening tool which tells you how a particular topic is discussed among social media. This can be an advanced way to monitor things like brand and products. It can also be used to generate new ideas to post and engage the audience. Followerwonk is a most useful tool which is specifically meant for Twitter. It will help you to choose people to follow and increase the audience. If you are active on Twitter, then this tool will identify your followers and will locate them. Everypost is used to gather all the information from YouTube, Instagram, Flickr, RSS feeds, and more. It helps you in scheduling the posts according to the audience in each of the social media platforms. This way, you can increase the effectiveness of all post. Bitly is a social media tool which supports you to reduce the size of any URL. It also tracks the results with link analytics and also optimizes your marketing efforts. Tailwind is a tool which helps you to reach both Pinterest and Instagram. You can pin to a number of boards and schedule post using drag and drop calendar. Bulk upload is also possible using Tailwind. Agora Pulse is a tool for social media management that helps to schedule and analyze posts. It also gives information about how your social media campaign stacks up against competitors. They even offer a free trial. CrowdBooster delivers real-time information like tweets, comments, shares, likes, etc that you can access instantly. The reports can be created for measuring key performance metrics. It also suggests, who you should engage with and how to improve the content. Visage is a tool that is used to create social media graphics. It helps to design various social media graphics that are optimized for different platforms. Visage tool also maintains consistency by managing the brand’s style and graphics templates. Audisense is a tool which helps you to identify your target audience. It optimizes the audience engagement with tracking and reports which provides some information about the interest of the audience. Tweepi is a social media tool for Twitter. It helps to get more followers on Twitter by identifying the audience who are interested in your topic. Socialbakers is a tool which helps you to make decisions based on analytics. Your performances can be measured and this helps to improve and monitor customers. You can boost your customer acquisition, retention and growth by improving your content. Socedo is a social media tool which helps to identify your target audience. It finds people in social media who are in your buyer persona. By discovering the target audience you will be able to separate the products accordingly and promote the products which suit the buyer persona in a particular place. SocialFlow is a tool which helps you schedule posts. It can identify the active target audience and their real-time interest. SocialFlow collects data according to your business rules and assists you with the right platform, the right content and the right time to publish. Brand24 is a tool which allows you to have prompt access to social media, popular publishers and even the mentions of your brand around the web. Using this tool you can identify social media influencers. Social media tools are evolving constantly with new apps and platforms that will help you to upgrade your social media result. The functionality of each tool is different from one another. Hence, consider the social media goals and gather your requirements. This can help you to choose a set of tools as per required functionalities. By choosing the perfect social media tool you can improve the customer experience and boost engagement. At Small Business Web, we provide services which will help you in all possible ways to get conversions in social media. Contact us today! We are happy to help you. Do you have any queries? Have we missed anything? Comment your thoughts below.